Common Core Standards met in this lesson: RI.9-10.1, RI.9-10.7, W.9-10.2 (see details below). Describe the role of film in creating national identity. State and support an opinion about the importance or unimportance of historical accuracy in film. Kurmanjan Datka: Queen of the Mountains stars Elina Abai Kyzy, pictured in the movie poster above, who portrays the early years of the historical 19th-century heroine remembered by Kyrgyz today as ulut enesi—mother of the nation. How does the film Queen of the Mountains contribute to a sense of national identity in Kyrgyzstan? It was only 25 years ago that Kyrgyzstan became an independent nation. How have the people of this young country gone about defining their national identity? “Epic Nation” suggests that movies have been part of the process. Read “Epic Nation.” Then, working alone or with a partner, read it again, looking for the parts of the article that address the ways that the film Queen of the Mountains helped create a sense of national identity in Kyrgyzstan. Make a list of your findings. In making your list, remember to think about both the process of making the film and the film’s content. What is a “national narrative”? One part of national identity might be called a “national narrative.” A narrative is a story. But a national narrative is something more. It’s a particularly powerful story, one that shows up over and over again. The United States, for example, has a national narrative that Americans tamed the wild frontier. That narrative became especially popular in the Westerns that Yunis refers to. The same narrative reappeared in the years when the United States was actively exploring outer space. Think about this narrative as you begin to think about Kyrgyzstan’s national narrative and what the article suggests about it. How has Queen of the Mountains helped create that narrative? How does a national narrative compare to a nation’s history? The example of the US narrative raises an important question: Is a national narrative necessarily accurate? In recent decades, many people—including historians—have questioned the validity of a US narrative about conquering the frontier. They point out that what the narrative calls the frontier was actually occupied by people who had their own civilization and way of life. Conquering the frontier meant conquering them, which suggests a different narrative. Find and underline the part of “Epic Nation” that addresses the accuracy of Queen of the Mountains. What inaccuracies did historians find in the film? How important do you think the inaccuracies are? People who study films will remind people who criticize movies for not being accurate or realistic that they aren’t meant to be accurate or realistic. The question to ask, then, is: Why was the film inaccurate or unrealistic in the ways that it was? To answer that question (beyond just saying a mistake was made by the filmmakers) you need to think about what makes a good film and what happens if a true story doesn’t fit the criteria for a good film. If you can, watch a film that describes itself as historical. Ideally, you can watch Queen of the Mountains. But if you can’t, try Steven Spielberg’s Lincoln, or the film Sully, based on a 2009 incident in which a pilot landed an airplane on the Hudson River. Read reviews that identify the ways that the film diverged from what actually happened. Based on the film and what you’ve read about it, why do you think the filmmakers changed the actual events in making the film? And finally, does it matter whether a historical film is accurate? “Epic Nation” says that “few [viewers] knew the difference” between the film (including its inaccuracies) and Kyrgyzstan’s history. How important do you think it is that historical films be accurate? Hold a class debate with one side arguing that accuracy is very important, while the other side argues that it isn’t. One of the only photographs of Kurmanjan Datka was made by Finnish Colonel Carl Gustaf Mannerheim in 1906, when she was about 95. 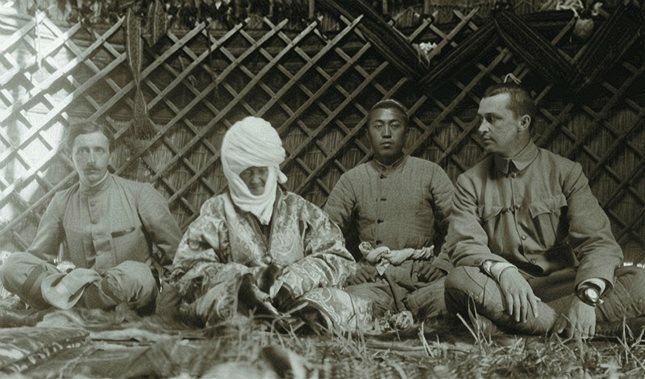 From left to right: French ethnographer Paul Pelliot, Kurmanjan Datka, a grandsom of Kurmanjan Datka and Carl Gustaf Mannerheim. At the end of “Epic Nation,” writer Alia Yunis answers the question “Does a legend make a film or does a film make a legend” What is her answer? What is yours? Write a short essay in which you present your answer, and provide evidence and arguments that support it. W.9-10.2 Write informative/explanatory texts to examine and convey complex ideas, concepts,and information clearly and accurately through the effective selection organization, and analysis of content.